Hope S. Hwang’s Guildhall was Alderac’s surprise release in 2012, a game that was suddenly there with no prior announcement. As it is a pure card game with six types of action cards, and rather popular, the expansion is much less unexpected. Its name is Guildhall: Job Faire and is what we call a standalone expansion: you can play it alone, but you can also mix it up with the original Guildhall. Job Faire doesn’t bring any fancy new rules, it brings six new professions to the game and that’s it. But everything in Guildhall is about the professions anyway, so doubling the options for those – I say options because you pick six when mixing both games, you don’t play with all twelve – extends the game quite nicely. What is this Guildhall thing all about, then? It’s basically very easy: on your turn, you play two cards from your hand into your guildhall – the play area in front of you – and get effects based on the profession of those cards and the number of cards of the same profession already in your guildhall. The only restriction is the card’s color: you can never have two cards of the same profession and color in your guildhall. All cards except the Tax Collector – there’s always something special for government employees, isn’t there – have three levels of effect. You get the first with no cards or one card of that profession already in your guildhall, the second with two or three cards and the third with four cards. You can’t have more cards already in your hall because with five cards a guild chapter is complete and you cannot add any more cards to it. It also has all the available colours at that point, so you couldn’t add more cards anyway. So, since everything in this game is about the cards, and there are only six professions, here’s a quick walk through the guilds. the Scholars. They take up to five cards from the top of the draw pile and put them straight into your guildhall. Cards put there this way do not trigger their card effect, but Scholars are a very quick way to fill up your chapters, and if you can place the cards you need on top of the draw pile first with a Bricklayer, well, I’m sure you see the potential. Hunters are actually more like scavengers: they take cards back from the discard pile and swap them with cards in your guildhall. 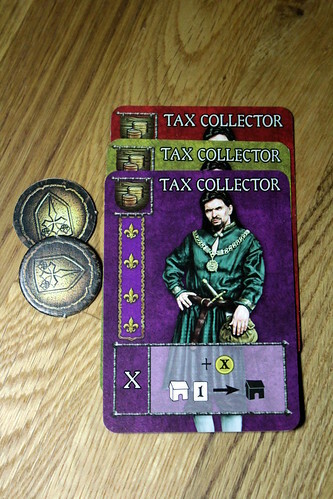 Peddlers have a more offensive action, they swap cards from your hand with cards in another players’ guildhall. You can use them to get cards you need, or to keep other players from activating the more powerful actions. Or both at once, if you never liked having friends anyway. For extra nasty, five Peddlers can swap two of your cards against a whole chapter from an opponent’s guildhall, with up to four cards – not five, because once a chapter is completed it can’t be manipulated any more, not by the owner, not by anyone else. It’s no surprise that Robbers are also there to piss off others. They take cards from an opponent’s hand and put them straight into your guildhall. 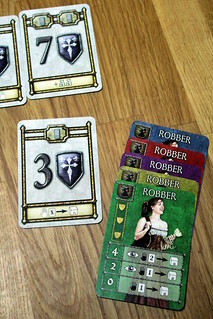 At the lowest level, the card is random, but with more Robbers you can pick the cards you want. Every successful band of Robbers has a spotter. But completing chapters is not the goal of the game yet, they don’t score any points. They are, however, the currency to buy points. Instead of playing a card into your guildhall, you can exchange one or two completed chapters against one of the available Victory Point cards. Which one would be a pretty easy decision – always take the highest one – if Victory Point cards didn’t also have special abilities, usually more powerful the less points the card is worth. Three points isn’t much, but three points and the option to put as many cards from your hand into your guildhall as you want? That’s pretty cool when you have a hand full of cards. As mentioned above, when someone reaches 20 points he wins. A game of Guildhall: Job Faire doesn’t usually take very long, twenty points can be scored quickly. But only if the other players let you, sniping at other players’ chapters with four cards so they cannot complete them is a common way to have fun here. 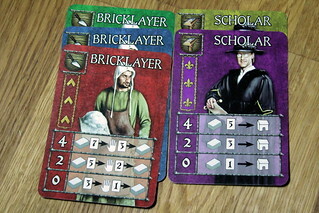 That does slow down the game a bit, but there are plenty of options to get two or three cards of one profession into play in one round – this is where the Bricklayer/Scholar combo really shines. This sniping at successful players and trying to still complete your chapters is a light yet fun style of interaction that only rarely gets frustrating. When it does, it’s mainly for the leading player in a four player game, because Job Faire can involve some leader bashing. But even then, there is a fighting chance, you never feel hopeless. Guildhall: Job Faire is a fun, quick game with a bit more direct interaction than average in its weight class. Now, I must admit that I never played the base game Guildhall. But looking at the cards there, they seem different enough that owning both and mixing them is definitely worthwhile if you enjoyed one of them. The only unanswered question is: what sort of project do Bricklayers and Tax Collectors cooperate on that scores seven points? What is the meaning of the Victory Point cards? We have been trying to puzzle that out, but it doesn’t make a lot of thematic sense. You don’t often have 25 players to fit into one game. But when you do, what are you going to do? Name one single game that fits that many people and doesn’t involve drinking. Well, we have one for you now. Jacques Cousteau awakened the fascination for the submarine world in many of us. His film productions present the wonders hidden under the surface of the ocean, and yet they awaken curiosity for more. I think Monsieur Cousteau would approve of the way fellow Frenchman Antoine Bauza presents the underwater world in his game Oceanos: not as a place for warfare, like many games have done before, but as the object of curious discovery. Stefan Feld is at it again, exploring the possibilities to combine luck and strategy in one game. This time, his exploration takes him to Belgium, the city of Bruges to be precise, where you build canals, work on your political career and, most important of all, make influential friends. But even those friends will have a hard time helping you when dice and cards are not your friends. Move to Italy, by a vineyard, grow wine, that’s not a plan that appeals to me. But put the same thing in a boardgame and suddenly I’m interested. Viticulture is a classic worker placement game about running a vineyard, from growing to selling wine, while giving tours and entertaining visitors on the side. Browser games being made into board games is still a very rare phenomenon. Besides Angry Birds, I can only think of this one: Farmerama. Are there reasons to be suspicious of Flash game adaptations? If there’s anything everyone knows about Lemmings, it’s that they have suicidal tendencies and enjoy the occasional long walk towards a short cliff. That’s what six scientists thought when making a bet about whose lemmings would leap further. Initially, the rodents proved more sane than the scientists in question, but a few generations of genetic tampering later, the Lemmings were happily leaping. Or being eaten by eagles, dead is dead.